French sovereign spreads have risen in recent months, coinciding with debate over the euro ahead of the country’s presidential elections in May. Italian sovereign spreads have been rising since the beginning of 2016. This column argues that investors are not pricing a break-up of France from the Eurozone. Most likely, they are pricing the possibility that the newly elected French government will not have enough supremacy to undertake important economic reforms. 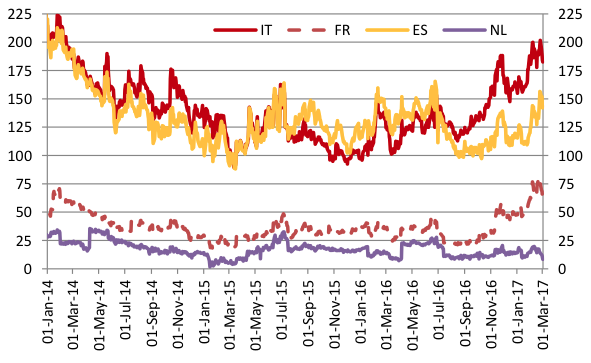 Market perception of redenomination risk in Italy, on the other hand, is rising slowly. Eurozone sovereign spreads, except for countries with more solid fiscal fundamentals, have been increasing recently. Currently, the sovereign spreads of Italy and France vis-à-vis Germany measured by the 10-year benchmarks have reached 180 and 60 basis points (with peaks in January 2017 of about 200 and 80 basis points), respectively – levels last recorded at the beginning of 2014 (see Figure 1). Are these developments the results of self-fulfilling speculations (i.e. redenomination risk) or are they connected to the underlying fundamentals (i.e. political risk)? Source: Thomson Reuters and own calculations. Note: This figure shows the 10-year Italian, French, Spanish and Dutch benchmark sovereign yields minus the 10-year German Bund in basis points (bps). Sample period: 01.01.2014 – 02.03.2017. Redenomination risk is the compensation demanded by market participants for the risk that a euro asset is redenominated into a devalued legal currency. The redenomination or convertibility risk concept was mentioned by Mario Draghi, President of the ECB, in a speech at an investment conference in London on 26 July 2012. He pledged to do “whatever it takes” to protect the Eurozone from collapse, announcing the possibility to engage in outright monetary transactions (OMTs) in secondary sovereign bond markets. In a few weeks by mid-September 2012, Italian and French 10-year sovereign spreads fell by about 170 and 40 basis points, respectively (see Figure 2). Clearly, the prevailing sovereign spreads in July 2012 were disconnected from the underlying fiscal fundamentals (De Grauwe and Ji 2012, Di Cesare et al. 2012, Favero 2013, De Santis 2014, Dewachter et al. 2015). Note: This figure shows the 10-year Italian, French and German benchmark sovereign yields in percent and to the left scale. The sovereign spreads vis-à-vis the German Bund are reported on the right-hand scale and in basis points (bps). Sample period: 01.03.2008 – 02.03.2017. Political risk is the compensation demanded by market participants for the risk that investments’ returns could suffer as a result of political changes or instability in a country. A change in government, for example, can induce investors to reprice the country’s risks, change the macroeconomic outlook, and modify the underlying forecast of fiscal fundamentals. Political risk and redenomination risk can also be positively correlated if a party, with the potential to win an election, decides to exit the Eurozone and redenominate its debt. The economic programmes of the National Front in France and of the Five Star Movement in Italy, both with a poll of around 25%, call for a euro exit referendum and the creation of a new currency. The redenomination of the Italian and French sovereign debt in a devalued new legal currency would be treated as a credit event. Therefore, intra-Eurozone redenomination risk is measured as a joint risk of the probability of a sovereign credit event and the depreciation of the new legal currency (De Santis 2015). Yields of CDS contracts issued in different currencies are compared with the intuition that their difference should reflect expected exchange rate movements. Specifically, the redenomination risk perceived by markets is computed as the difference between the US dollar-denominated and euro-denominated sovereign CDS spreads (i.e. quanto-CDS) relative to the German quanto-CDS. This spread determines the perceived risk associated with the depreciation of the new currency against the new euro (partial break-up of the Eurozone) or the new Deutsche mark (full break-up of the Eurozone). The redenomination risks for Italy and France behave according to expectations (see Figure 3). They reached the highest level before Draghi’s speech in July 2012. Afterwards, they declined sharply reaching zero at the beginning of 2015, despite the intensification of political risk from Greece since mid-May 2014, and stabilising over the course of the year. Subsequently, since the beginning of 2016, developments of such risk in Italy and France have followed different patterns. Redenomination risk in Italy has been on a rising trend, reaching in March 2017 the levels that prevailed at the beginning of 2014, but far below the 2012 hikes. Instead, redenomination risk in France has fluctuated close to zero, increasing marginally more recently. This implies that investors are not pricing a break-up of France from the Eurozone. The recent rise in sovereign spreads is due to political risk. Most likely, given the close ballot, investors are pricing the possibility that the newly elected government will not have enough supremacy to undertake important economic reforms. Note: This figure shows the redenomination risk in Italy and France at 3- and 5-year maturity in basis points with a 20-day forward moving average. It is measured as a difference between Quanto CDS for Spain and Italy and Quanto CDS for Germany. The Quanto CDS is computed as difference between the sovereign CDS quotes in dollars and euros. De Santis, R. (2015). “A measure of redenomination risk”, ECB WP n. 1785. Sample period: 01.03.2008 – 02.03.2017. While French sovereign spreads started to rise in November 2016 amid mounting political risk, Italian sovereign spreads have been rising since the beginning of 2016, together with the redenomination risk. In the last 15 months, Italian sovereign spreads have increased by about 80-100 basis points. The rising trend at a snail’s pace in the market perception of redenomination risk in Italy is worrisome, and this is particularly important if an adverse shock hits the Italian economy in the future. Since the start of 2013, all new Eurozone government securities with maturity above one year have included collective action clauses (CACs), which require a supermajority of bondholders to agree to any changes of the underlying contract (EU EFC 2013). It is sometimes argued that the new EU discipline on CACs has introduced an important restriction, which could restrain a country from redenominating its bonds, if such clause is included. This is incorrect (see Codogno and Galli 2017). Redenomination in a new legal currency, including of bonds, with CACs remains viable, if the bond is governed by the domestic law of the sovereign issuer (according to lex monetae) (Moore and Wigglesworth 2017). This implies that the costs associated with redenomination are independent of the volume of bonds, including CACs. This also implies that the comparison between yields of bonds under CACs and bonds containing no CACs is not a useful exercise to extract measures of redenomination risk. Figure 4 shows clearly that the spread between two bond yields that have the same characteristics being issued by the Italian Treasury, in euros, with similar coupons and residual maturity, except for the CAC clauses, is very marginal, fluctuating around minus and plus 10 basis points. Source: Bloomberg and own calculations. Note: This figure shows the Italian bond yields maturing in 2023 with a coupon around 4.5% (left scale). 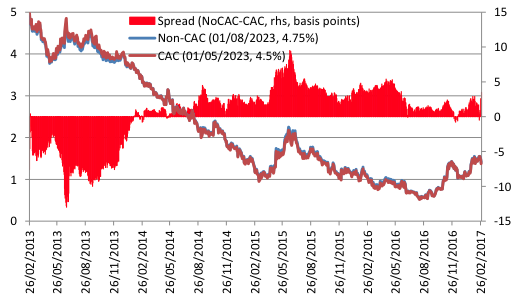 The sovereign spreads between the no-CAC and CAC bonds are reported on the right scale (rhs) and in basis points (bps). Sample period: 26.02.2013 – 01.03.2017. Unfortunately, history cannot provide us with suitable examples to estimate the costs associated with currency redenomination. Redenomination occurred in the past after hyperinflation and sharp currency devaluations, with governments adopting this policy to anchor inflation expectations (Helleiner 2003). Clearly, this is not a plausible explanation in the current context, as Eurozone inflation has been rather muted. Over the period 1949-1994, Rose (2007) counted 68 departures from currency unions and found remarkably little macroeconomic volatility around the time of currency union dissolutions. This is because the historical examples counted for many developing countries and, more generally, for countries with less than 0.5% of world GDP and much less in terms of financial market size. It is generally agreed that the consequences of the Eurozone breaking up could be severe, because the Eurozone plays an important role globally in terms of its economy and financial markets – the Eurozone accounts for about 20% of world GDP, 35% of global bank assets and liabilities, 40% of over-the-counter (OTC) interest rate derivative markets and 35% of OTC foreign exchange derivative markets (BIS 2014, ECB 2014). Also, back-of-the-envelope calculations based on a simple 30-50% depreciation of the new legal currency do not take into account the impact of such decisions on sovereign yields, corporate yields, equity prices, lending rates to households and non-financial corporations, interbank interest rates, through-fire sales, and spillovers, which would render redenomination risk systemic for all Eurozone countries and across all economic sectors. In addition, the associated default would make extremely difficult the refinancing of the sovereign debt, with sizeable liquidity premiums that would be reflected in higher sovereign yields and higher financing costs for the entire economy. Nevertheless, the experience of 2012 is very informative, because about 30% and 40% of the respective French and Italian sovereign yield spreads could be explained by market perception of redenomination risk (De Santis 2015). In addition, important spillovers among countries were recorded. The consequences of a simple rise in sovereign spreads with the associated uncertainties led to an economic recession in many countries. The redenomination of the Italian and French sovereign debt in a devalued new legal currency would have dramatic consequences for banks, insurance, pension funds, and individual investors, as their assets would lose value, as well as for businesses, as financing conditions would increase throughout the Eurozone. Author’s note: The views expressed in this column are those of the author and do not necessarily reflect those of the European Central Bank or the Eurosystem. BIS (2014), OTC Derivatives Statistics at end-December 2013, Basel. Codogno, L, and G Galli (2017), “Italexit is not a solution for Italy’s problems”, LSE EUROPP. De Grauwe, P, and Y Ji (2012), “Mispricing of sovereign risk and multiple equilibria in the Eurozone”, CEPS Working Paper, no. 361. De Santis, R A (2014), “The euro area sovereign debt crisis: Identifying flight-to-liquidity and the spillover mechanisms”, Journal of Empirical Finance, 26: 150-170. De Santis, R A (2015), “A measure of redenomination risk”, ECB Working Paper Series, no. 1785. Dewachter, H, L Iania, M Lyriox, and M de Sola Perea (2015), “A macro-financial analysis of the euro area sovereign bond market”, Journal of Banking and Finance, 50: 308-325. Di Cesare, A, G Grande, M Manna, and M Taboga (2012), “Recent estimates of sovereign risk premia for euro-area countries”, Banca D’ Italia Occasional Papers, no. 128. ECB (2014), International Role of the Euro, Frankfurt am Main. EU Economic and Financial Committee (2013), “Collective Action Clauses in Euro area”. Favero, C A (2013), “Modelling and forecasting government bond spreads in the euro area: A GVAR model”, Journal of Econometrics, 177: 343-356. Helleiner, E (2003), The Making of National Money: Territorial Currencies in Historical Perspective, Ithaca: Cornell University Press. Rose, A (2007), “Checking out: Exits from currency unions” CEPR Discussion Paper, No. 6254.